This book giveaway is part of the Fool for Books giveaway hop. Also, No Fooling!, comments on this post count toward my library-challenge fundraiser (I donate money to libraries per comment). Just leave a comment on this blog post by Saturday night, April 2, at midnight EDT. One entry per person. You must include your email or some way for me to contact you. If the winner doesn't respond, I reserve the right to select another winner, or not to award the prize if I cannot reach the winner. You must be at least 13 years old and able to receive your book via the mails in the US or Canada. The recipient will be chosen at random. 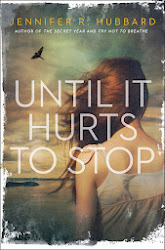 A signed paperback of this YA novel. Synopsis: After his secret girlfriend's death, seventeen-year-old Colt finds the notebook she left behind, but he is unprepared for the truths he discovers about their intense relationship. I've been a-visiting again, exploring the internet beyond the margins of my own blog. Teralyn Pilgrim asked permission to repost a favorite of mine, "An Unusual Take on Conflict," where I discussed what a book about two improv actors taught me about writing. 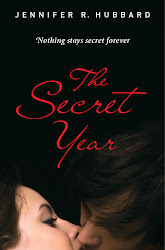 I was also apparently the first guest blogger ever at Kelly Fineman's Writing and Ruminating, where Kelly asked me to talk about poetry and how it influenced The Secret Year, and how I solved the problem of showing a character's poetry when I don't write much poetry myself. While you're clicking around, please comment on the participating blogs in the Library-Loving Challenge, where there are now a dozen participating bloggers, and follow the Twitter accounts @Margorowder, @JanetSFox, @MarineCorpsNomd, and @JennRHubbard to increase the donations. You play, we pay! Thank you to everyone who has commented and spread the word and donated. "One must believe that private dilemmas are, if deeply examined, universal, and so, if expressed, have a human value beyond the private, and one must also believe in the vehicle for expressing them, in the talent." "We do the best we can and hope for the best, knowing that 'the best,' so far as selling goes, is a matter of chance. The only thing that is not chance is what one asks of oneself and how well or how badly one meets one's own standard." "... many feel their own suffering is unique. It is comforting to know that we are all in the same boat." In these tough economic times, library budgets are getting slashed just when their communities need them most. For every commenter on this post between now and Saturday, April 2, at 3 PM EDT, I will donate 50 cents to Cheltenham Township Libraries (PA) and 50 cents to the Free Library of Philadelphia, up to an amount of $100 total. (But if you see I've reached the cap, keep commenting, because I might be persuaded to increase my cap. It's been known to happen.) Update: While my own challenge is now closed (except for the Fool for Books giveaway, which continues through midnight), I urge you to click through to the blogs listed below, and comment there to help their libraries! How easy could it be? You comment, I cough up the money, the libraries get a gift! If you don’t know what to say in your comment, “I love libraries” will do. And watch for a book giveaway later this week; if you want to be considered for it now, just leave your email or some way to contact you in your comment. I think they are a fabulous idea. What's especially exciting about the YA world is that many of the book blogs are written by teens, i.e., our primary audience. Not that I don't welcome adult readers of YA, too, because I absolutely do. I welcome every reader. I'll be honest: I love people talking about books. I want people talking about books online. (And on the train, and on TV, and on the beach, and in the school halls, and over the office water cooler, and at family dinners.) I'm never going to say we should have less discussion about books. The fact that people are willing to spend hours of their free time reading books and blogging about them thrills me. Not only that, book bloggers often come to author signings. I've even known bloggers who have organized live book events and fundraisers! I know that every blogger didn't love my book. Many did, some didn't. I don't even know the exact numbers or names because I don't keep a scorecard. I only read a small number of blog reviews, for two reasons: 1) I need to keep most of my mental energy for writing my next book; and 2) reviews aren't really for me; they're intended to help readers figure out whether a book is for them. I'm happy to join a discussion about my book when invited in, and if someone sends me a compliment, I respond with thanks, but otherwise I keep out of it. To a certain extent, the book belongs to readers now. Authors do expect--and frankly, deserve--politeness and professionalism from the bloggers who ask for review or giveaway copies, interviews, and the like. Most writers only receive a small number of advance or final copies of our own books; the rest, we buy ourselves, and we can't say yes to every request. For my own part, I've been lucky that those who approach me have been polite and professional, and it's always my goal to be so in return. There's often discussion about whether book blogs have an impact on sales, and if so, how much. I don't know the answer to this. Because blog content stays up forever, it's difficult to know when someone sees a blog that might influence a sale, and when the reader actually purchases it. Here's a true story from my own life. I read a brief synopsis/recommendation of Neal Shusterman's Unwind online. It sounded intriguing, so I wrote it down in the little book where I keep a running list of books I want to read. The list is long, and I didn't get around to Unwind immediately. In fact, one year later, I was in a bookstore looking for a book they didn't have. But I saw Unwind on the shelf and recognized its title, and bought it that day. I'm glad people are blogging about books. Leave your links in the comments, below. Please link to the specific library-challenge post, rather than to your general blog. My post will go up by Monday night and will include all the links I have by then. Thank you! I once posted about a piece by Heather Sellers in which she said writing "takes extraordinary focus, attention, and acres of time." I've found myself mentally quoting that "acres of time" phrase a lot lately. This is especially true of my writing at the first- and second-draft stages. I need thinking time, digesting time. The stewpot in my brain is working on something; it needs time to simmer. I would love to be able to bang out a novel in a week, but my brain won't make the necessary connections at that speed. Something happens in the hours I'm not at the writing desk; something changes in me between writing sessions. I can leave my desk with absolutely no idea of where the characters are going next--and 24 hours later, I know. Without question--it's so obvious now! I need time to follow false leads, backtrack, rewrite. I write scenes that end up on the cutting-room floor. I need time to second-guess, to scrap scenes and characters and subplots and replace them with something stronger. I need time to gain access to my characters' deepest secrets, to fight through their defense mechanisms. I need time to figure things out. Some people can write quickly. That's wonderful, and enviable. But some of us just have to simmer. Many thanks, as always, for the great comments I get on my blogs. You all really make me think! Oliver's world is just like our own--except that people get "Deathday letters," 24 hours' notice before they pass away. And snarky 15-year-old Oliver has just gotten his. Which renders him, in his own words, "living-challenged," and with some major choices to make about how he'll spend this day. Q: I somehow managed to miss the "Intro," where you tell the reader up front that Oliver is really going to die. And so I read the book with a sense of suspense about whether Oliver might manage to get out of this somehow. When I looked back and saw the Intro, I wondered why you included it, rather than keeping the reader guessing? Was it that a humorous book sets up such strong expectations for happy endings, that you felt obligated to warn readers against pouring their expectations into that mold? A: This is an interesting question. That intro was the first thing I wrote. There was an epilogue too, which I lovingly referred to as my "Outro" until we finally decided to cut it, but the intro was, to me, the most important part of the book. A small portion of it was to keep the reader's expectations grounded. We've become so accustomed to happy endings that I didn't want anyone to feel duped. But my main reason for putting it out there was to let the reader know that despite being a book about one boy's death, we wouldn't be focusing on watching him die. It was my way of letting readers know that they should be paying attention to how Ollie spends his last day rather than trying to figure out whether he's actually going to die or not. Take any book. Take the Harry Potter series. We know through all seven books that Harry is going to face Voldemort. We also have the expectation that Harry is going to triumph over his enemy. So as we march toward the end, we spend time trying to figure out how Harry is going to survive. The tension comes from wondering how Harry is going to defeat Voldemort. But what if J.K. Rowling had prefaced Book 7 by telling the reader that Harry was going to die. What if she said that Harry would not, in fact, defeat Voldemort. People would have read the book looking, not for how Harry was going to survive, but how he was going to die. The tension would come from the How of Harry's death and from watching him reach that inevitable end. With Ollie, he knows he's going to die, the reader knows he's going to die, so the story isn't how one boy escapes certain death, but how he meets it. Q: Do you wish people actually got Deathday letters? If so, how long a notice do you think is optimal--one day, as in the book? Or one week, one year? Or do you think we're all better off not knowing when? A: I think 24 hours is a good number. I thought about this a lot, actually. Too long and it would feel so drawn out. There's a scene at the end of Deathday where Ollie laments having to keep saying goodbye to people. He's spent. And that's only after one day. I couldn't imagine a whole week or a whole year. But I think a day is good because it gives you just enough time for family to come say their goodbyes, even if they live far away. But since we don't get Deathday letter, I think we should all live as if we only had 24 hours to live. One of my favorite poems is TO THE VIRGINS, TO MAKE MUCH OF TIME by Robert Herrick. The first line, "Gather ye rosebuds while ye may," encapsulates the carpe diem philosophy that I wanted to bake into Ollie's journey. Of course, old Herrick wrote the poem to try to convince some impressionable girls to part with their virtue, but the sentiment is solid. Q: There have been books about kids who know they're dying, but they tend to take a darker, more tragic bent--for obvious reasons, since the topic is inherently sad! And The Deathday Letter certainly has its poignant moments. But there's also a lot of humor that gets quite edgy at times. What made you decide to blend earthy humor with impending doom? A: A couple of people have commented that they wouldn't have chosen to spend their last day on such immature pursuits, but Ollie is a normal guy. He's not your typical hero. He doesn't read Wuthering Heights or spend his days writing poetry. He's probably not the kind of guy girls fantasize about ending up with. But he's the kind of guy who sat behind you in math class. The kind of guy you went to prom with because you couldn't find anyone better but ended up having a good time despite yourself. I wanted to see how someone so average would respond to something like this. Ollie starts out not sure what to do. Despite the ubiquitousness of Deathday letters in Ollie's world, he hasn't spent much time thinking about what he'd do if he got one. He doesn't have a life plan. He's just been sailing through life, figuring he'd always have time to do stuff. Until he got his letter that is. As you say, it's obvious why most books about people who are dying tend to be dark, but that was never going to be Ollie. He met death with the same slacker mentality that he met everything else in his life. The thing that people don't like to think about is that we're all dying. Right now, you're dying, I'm dying, everyone reading your blog is dying. It might not happen for fifty years, it might happen tomorrow. Knowing the when shouldn't change how you live your life. Every person has the ability to choose how they attack life. Either we can let it get us down or we can laugh at it. With The Deathday Letter, I chose laughter. Q: Since you wrote this book, how many people have asked you how you would spend your own Deathday? ;-) I won't ask you to fill out the whole day's schedule, but what's one thing you would make sure to do? A: So many! I kind of expected it though. But if I only had one day to live, one thing I would HAVE to do is get into a fist fight. I know it sounds odd, but I've never punched anyone in my life, nor been punched. I'm not a particularly violent person, but I've always been morbidly curious as to what it would feel like to be in a real fist fight. Then I would eat a lot of pie. Shaun David Hutchinson is a writer and a self-described "major geek" who can be reached "via tin cans and string," or on Twitter where he goes by the name @ShaunieDarko. His next novel is due out in 2012. I commented on the post, and she quoted me in the follow-up post that links POV to issues of character and plot. Which, by the way, is brilliant, and I don't think I've seen multiple POV discussed from that angle before. Which isn't to say that it can't work, or that it hasn't been done well. I liked the technique in Paul Zindel's classic, THE PIGMAN. And Brent Hartinger's SPLIT SCREEN is one of my favorite examples: there are only a couple of "overlap" scenes, and the dual narration serves as two halves of a puzzle: together they tell the reader more than either part alone. So, although I think it can be done well and is often necessary, I want to talk about when it might be a good idea to fight the impulse. Now that there are so many examples of multiple POV out there, a writer's first instinct may be to use this technique when she wishes to show what a character other than the first main character is feeling or thinking--to jump out of one character's head and into another. Tabitha suggests asking what purpose the multiple POV serves. I would suggest that if the only answer is, "We need to know what Character Y thinks/feels," there are other ways to approach the story. Part of the fun of reading is putting the puzzle together ourselves: picking up clues, interpreting the action of the story. Characters give all sorts of cues to their thoughts and feelings: In what they do, and how they do it. In what they say, and what they don't say. If the character just up and tells us what's on his mind, it can spoil some of that fun. An interesting challenge for the writer is conveying the inner life of a character without bringing us directly inside that character's head: through gesture, timing, tone, dialogue, action, reaction. There are a lot of group author blogs out there, but one that consistently hits it out of the park is YA Outside the Lines. No, I'm not one of the participating bloggers. Some of the participants are my online friends, but frankly that doesn't matter for my recommendation--and some of my favorite posts there have been written by writers I don't even know. Lauren Bjorkman recently posted on revising to make sure the character wants something, which hit home with me because I've been doing the same thing. Wanting is energy. Indifference is inertia. A character who doesn't want anything has no reason to do anything, and the reader doesn't have much reason to read about her. R.A. Nelson on Orwell's 1984 from a different point of view: "Julia was spunkier than Winston. More vital and upbeat. Willing to take bigger risks. In spite of everything, she wasn’t a downtrodden character ..."
Barbara Caridad Ferrer on why we need critiques and patience: "The immediate gratification is cool, sure, and God knows, after more than three years of work, I really, really wanted it, but I need an editor. I need an outside eye. I need people to be honest with me. Most of all, I need time." Sarah Porter on dark and edgy subjects in YA, and why it's vital for someone to write about them: "I felt responsible for preserving a certain moral and emotional realism, and for respecting just how difficult it can be to navigate the darkness of our existence." Prologues are always a hot topic around writers' water coolers (including virtual water coolers). Today's post was sparked by my seeing Curtis Brown's Sarah LaPolla (@sarahlapolla on Twitter) tweet this about prologues: "Whatever you think you need it for, you don't." I've certainly seen books where I thought the prologue was totally unnecessary. Or even thought that it hurt the book by revealing the solution to a mystery that the main characters spent hundreds of pages solving, undercutting the suspense. Prologues are also risky because they are the reader's first introduction to the work. The reader gets involved in a world and a set of characters, and then--boom, that world and those characters disappear, and we start all over in Chapter 1 with another world and new characters. Even if the world and characters overlap, it's disconcerting, and it's a lot of mental work for the reader to build two settings in such a short time. It also can keep the reader from really committing to the work--we know this is just a prologue, and these people are going to disappear in a couple of pages. I'm not anti-prologue. (When it comes to writing, I'm rarely an absolutist!) I think prologues work best when they foreshadow rather than give an outright solution; when they set up a problem that the main characters will have to solve, and we're not sure how that solution will play out. To test whether a prologue is needed, try this: Cut out the prologue and give the manuscript to a trusted critiquer who hasn't seen the story before and doesn't know the plot ahead of time. See if the critique produces a criticism that there's something missing, or confusing about the backstory, or any other comment that would point to the necessity of the prologue. If it doesn't, keep the prologue out. However, if there's a comment that only says the beginning is slow, that doesn't necessarily call for a prologue; it could call for a strengthening of Chapter 1 instead. "Start your next book now"
I'm happy to bring you another guest post on "second books." Today's guest author is Rosanne Parry. The very best advice I got when I shared my news with my author friends that I had sold the manuscript to my first novel, Heart of a Shepherd, was, “Publishing takes a long time. Start your next book now.” I got this same advice from Susan Fletcher, Heather Vogel Frederick and Carmen Bernier Grand—all authors who live here in Portland. I am a notorious ignorer of good advice but three times was apparently the charm, because I took them at their word and got busy with a new story while I was waiting for the edits to come on Heart of a Shepherd. And thank goodness I did. It was almost 3 years between the sale of the manuscript and the release of my debut book. My editor and I talked about what kind of book we wanted for the second one, because my first was set in rural Oregon and had a very regional flavor. We decided to go with something a little broader in scope. Because I know what middle grade kids think about books that make you cry, I wanted to do one that was a little lighter in its content. So we decided on a road trip adventure story about three girl musicians who live in Berlin at the end of the Cold War. It’s called Second Fiddle and it was all joy to write. Here’s what I found easier about a second book. 1. I am fortunate enough to be with the same team of people who helped make Heart of a Shepherd such a beautiful book. Second Fiddle is at Random House, with my insightful and generous editor, Jim Thomas, his champion assistant, and now editor in her own right, Chelsea Eberly, and with the amazingly hard working school and library department and the best copy editors on the planet! So this time I didn’t worry about deadlines. I didn’t worry about the cover art or the details of production and marketing. I’m confident that I can leave those things to team Random House and just focus on the story. And look! They gave me this amazingly beautiful cover! 3. I’ve always had a great writing community in Portland, but as I’ve participated in the Class of 2K9 and the Mixed Up Files blog and the Powells Young Writers Workshop, I’ve found a much wider circle of writing friends. I’m grateful for their support every day! And here’s what’s difficult about a second book. 1. In a word, expectation. My first book was warmly received, which was as wonderful as it was unexpected. Before I only owed it to myself to grow with each book I wrote, but now others have this expectation, too. It’s great to have earned the expectation, but it’s hard to meet it without writing the same story over again. It’s also tricky, when you know the kinds of things people are going to ask you in interviews, not to think of those things when you are writing. But thinking of those interview questions is like pouring cold water on the heat of whatever scene you are writing. Disastrous! 2. I can see now how easy it is to get pigeon-holed in one category. So I need to choose each new project carefully to build on the readers I have but still grow and gain new readers. I never thought about any of those considerations before my first book came out. I feel very lucky to have strong guidance in this area both from my editor and my agent, Stephen Fraser. 3. More than anything, I find it’s not finding the time to write, as much as it’s learning to divide my attention between the tasks of promotion, the maintenance of my business, and the production of new work. I worked very long hours in the last year, but I’m delighted to say that I finished a first draft of my third story, The Wayfinder, one month before the launch of Second Fiddle. I’m so relieved to have that accomplished, so that I can put my full attention to Second Fiddle which was great fun to write, in part because I started playing my violin again and playing in a trio with my own daughters which I love, love, love! I’m going to have a bunch of book events this spring in which I play music with kids at bookstores and libraries. You can check my schedule at my website. If you’d like me to come to your school, library or bookstore to talk about music and books you can reach me at rosanneparry@comcast.net. "Because I am thinking so much about the past these days I have come to see that the past is always changing, is never static, never 'placed' forever like a book on a shelf. As we grow and change, we understand things and the people who have influenced us in new ways." I recently wrote something that was partly informed by my own life experience. I could not have written it the way I wrote it back when I was closer to the events that influenced it. The story reflects where I am now, what I have learned since then. I'm working on something now that has been emotionally difficult because I've been stuck, viewing the situation I'm writing about through one narrow lens. And when I write, I can't use a narrow lens. I may root a story in one character's worldview, but as the writer I have to understand every character in that world, including the villain. I have to see the world through the villain's eyes, at least temporarily. To improve this story, I have to humanize a character that I hate, and in doing so I know I will come to hate the character less. In fact, I will end up loving that character (which is different from liking or approving of the character). As long as I'm mired in judgmental loathing, this character will stay flat as cardboard. The interesting thing is that facing this issue in my writing requires me to face some truths about my past, to grow in ways I haven't been willing to grow until now. Writing isn't therapy, and I don't write literally about my life. But there's something beautiful about the way this distillation process works, about the way a story and a writer work on each other. People talk about the pressures of the publication process, the down times that writers generally don't expect because we go into it thinking that publication is the end zone, the part where you float up on a fluffy cloud, fulfilled forever, and nothing bad happens ever again. Naturally, the reality is that publication gives an author many special, beautiful moments, and it brings a few moments that are like a smack upside the head, but mostly life tends to go on as before. Publication won't fill your cavities, mow your lawn, or drive your dog to the vet. Life goes on. I've noticed that many of the down times are based on a gap between expectation and reality. Writers can get caught up in what kind of story they think they should be writing, how much promotion they think they should be doing, which award they think they should have won, how many copies they think they should have sold. And while it's great to have goals, there comes a point where we have to stop and enjoy the spot we're standing on. Often, I find that this simple switch in mindset flips me from anxiety to contentment. Yes, it would be nice if I could write description like John Updike or humor like David Sedaris or carry off the intricate wordplay of Vladimir Nabokov, but guess what? If people want to read that, they can read the original Updike and Sedaris and Nabokov, rather than some poor imitation. And yes, it would be nice to have Stephen King's income, but he's been at this a lot longer than I have. I'd love to win a Printz or a National Book Award, but I have no control over that. The only one who is ever going to write like me is--me. And that's what I "should" be doing, the main thing I need to do. The only one who can write like you is you. There's a part in the book Sophie's Choice when the main character marvels that he was preoccupied with trivialities on the same day that the character Sophie had to make her fateful (and fatal) choice. He suffers over the fact that he was leading a pretty good life while she (and millions of others) were undergoing horrible pain. This is a fact of the human condition: every day, somewhere in the world, someone is having a wonderful day while someone else is having the worst day ever. Great pain and great joy, luxury and poverty, mourning and celebration, live side by side, as do birth and death. When I post here about literature and writing, which have enriched my life so much, I am always aware of what else is going on in the world--whether I discuss it here or not. I decided when I started this blog to focus on a topic that brings joy to me and, I hope, others. I've never met anyone who couldn't use a drop or two more of joy in life. And I know that somewhere, every day, there is still pain in the world. This weekend, the world's ration of pain is so very high, I somehow feel compelled to explain that in discussing any other topic, as I will in the coming days, I am not unmindful of the catastrophic earthquake, fire, flooding, nuclear emergencies, and other disasters that are flaring right now. I've been grateful that technology allows us to follow the unfolding events, and to find places where we can offer help. And I've been grateful that people online are also discussing books and flowers and family and so many of the other topics that make life worth living. This is a tough time of year for me: the tail end of winter, when more snow is unlikely,* but it's still cold and the trees are still bare. After the rush of winter holidays, there are no more free days off for another couple of months. And Daylight Savings steals an hour of sleep from me. Also, it tends to rain a lot. This time of year is about waiting. It's about noticing the buds forming on tree branches, the green shoots poking up through the soil. It's about feeling a slight softening in the weather. Nothing's blooming yet. It's not warm yet. But spring is on the way. It's said that YA books can be very dark, and can even have unhappy endings, as long as there is some kernel of hope. No matter how bleak and gray the skies are during the course of the novel, the writer can point to a crocus or a daffodil and say, "All is not lost. Brighter times will come." *Yeah, I love snow. Everyone told me I would grow out of that, but I never did. My husband and I have been watching The Larry Sanders Show on DVD--not only the episodes, but all the "extras:" the interviews and commentary and so forth. There is quite a lot of this extra material, and I'm impressed by how much work Garry Shandling put into that bonus material. Say less. The actors and writers respected the fact that they didn't always need a line of dialogue to make an impact. Sometimes they could accomplish more with a look, a gesture, a beat of silence. This can be true of stories as well: a gesture, pause, or action may be better than a line of speech. Leave in the mistakes. If someone tripped during a take, it might just make it into the episode. Sometimes the mistakes opened up a new vein of reality for the actors, and actually enhanced a scene. Writers can also look for these "happy accidents"--lines that come up unexpectedly, but take the scene in a great direction. Focus on movement. Shandling admired the director's technique in one episode where the characters had to move rapidly from one location to another, the tension ratcheting up. (For many scenes, they actually used a cameraman on roller-blades.) Writer Peter Tolan commented on how the scenes set in the main character's house, where he was just sitting on the couch with his wife, were less interesting than the office scenes with everyone rushing around. This doesn't mean that characters must be constantly on the go, of course, and stillness can raise tension in its own right. But a writer may want to avoid a story where everyone is sitting in a room all the time. Let things get awkward. Several of the actors commented on how Shandling liked their characters to get vulnerable and uncomfortable. And in the interviews, Shandling put himself in several awkward positions: interviewing women with whom he'd had close relationships, for example. During interviews, the subjects often broke the fourth wall to comment on the camera or the microphones, apparently expecting these moments would get edited out. One interviewee stopped the interview to put his barking dog outside. Another interviewee conducted his entire interview while sitting in a bathtub (though discreetly covered with bubbles). Moments that usually get cut were left in (see also, "Leave in the mistakes"), enhancing the "behind-the-scenes" feel. These unpolished moments are sometimes the most interesting. Writers can let their characters be seen in these awkward moments: the ill-timed sneeze, the guffaw in a quiet room, the toilet paper clinging to the shoe, the insecure fussing in the mirror. 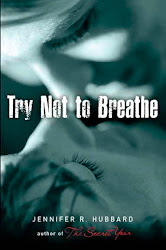 Today's guest post is by author Janet Fox. How is this process like, or unlike, your own? Jennifer Hubbard and I are cross-posting on the subjects of voice and plot. I found it so interesting to read her post, because we do have different approaches. I usually don’t have my novels well-plotted before I begin writing; all of my stories start from voice. I hear a sentence or two in my head, and it will be the voice of the character, and often I have no idea what kind of story she is trying to tell me. That’s when I need to take some pondering time. I’ll write snatches that may (or may not) become scenes; I’ll write the names of other characters and their relationships to the protagonist; I’ll sound out her chief desire; I’ll uncover the antagonist. I spend hours on walks sorting out what I think may be happening and why. I’ll often dream ideas that become important. Finally I’ll sit down and start writing, organically, with the voice of my main character firmly in hand. Once I have a messy first draft I can go back and pick through the scenes and find what works and what doesn’t and what’s missing. And at that point I may need to resharpen the voice. What tends to happen as I work is that I start out with a strong character voice, and while I’m crafting scenes the voice disintegrates until it’s my own voice telling the story. In my second draft, I work to be cognizant of the nuances of my main character’s voice again, hearing her tell the story, just as she did when it all began. I love the fact that there is no one right way to approach crafting voice and plot, that Jenn and I know what works best for each of us. Janet Fox is the author of the young adult historical novel Faithful (Speak/Penguin 2010), and the companion YA Forgiven (2011). Her blog address is www.kidswriterjfox.blogspot.com. The other day, Nathan Bransford posed the question: "How much can you talk about your idea before you write it?" Some writers are energized by talking about the story; it helps them generate enthusiasm and new ideas. But for me, the answer has always been: Not much. About works in first draft, the most specific I tend to be is, "It's a young-adult novel" or, "I'm working on a short story." The farther along I am, the more I can say about a story. Once it reaches the third or fourth draft, I can squeeze out a one-word description: a topic, perhaps, or even a one-line summary. A few drafts later, it's ready for critique and I not only tolerate, but require, lengthy analyses and discussions of how the book is constructed and what it's about. When it's finished, it's a pleasure to discuss the story with readers--at that point, I could talk about the book all day. But early on, that seed needs silence to germinate. *Naturally, this is not at all what my current work in progress is about. I don't think. We don't write in a vacuum. Our books don't spring onto the scene uninfluenced by any other book that has ever come before. We are all balancing atop a great stack of the literature that has preceded us. But sometimes, we intentionally adopt an earlier work to retell, or pay homage to. I'm rereading Braless in Wonderland right now, which includes many references to Alice in Wonderland (starting, obviously with the title). Ash is based on Cinderella; fairy tales are often fodder for retellings. There are multiple retellings of Jane Austen's works out there. Not to mention Shakespeare's. When I was working on The Secret Year, comparisons to The Outsiders were unavoidable. I wasn't writing a retelling, but I couldn't ignore the fact that there was a huge YA classic out there that had addressed some of the same issues I was writing about. It made me more conscious of some of my book's themes, about where I wanted to cover similar ground and where I was interested in taking a different direction, in focusing on a different angle. In dealing with a retelling of a classic, myth or folk tale, the author gets to choose where s/he will be faithful to the original, and where to veer away. The author must often decide which version of a folk tale to follow, or whether to combine versions. (It's fascinating to read multiple versions of the same story, and see how they changed over time and across cultures.) In dealing with more recent works, the author often needs to consider the ground that has already been covered by existing books and decide: How is my story different? Where is the fresh plot of earth in this well-known territory? What slant would be unique? What part of this story has nobody told before? One of my favorite scenes in the movie Amadeus is when the Emperor, fatigued by the outpouring of Mozart's talent, tells him that his music has "too many notes." "Too many notes?" Mozart repeats, stunned. "'These things are always seen and felt in a person's manner and conversation, if modestly used; but it is not necessary to display them,' said Mrs. March. 'Any more than it's proper to wear all your bonnets and gowns and ribbons at once, that folks may know you've got them,' added Jo, and the lecture ended with a laugh." 1. Jasmine walked quietly across the room. She went sneakily to the wall and put her ear flat against it. She tried hard to hear what Sean and Alicia were saying in the next room. At the sound of joyful laughter, Jasmine squeezed her hands tightly into fists. She took a quick glance at the door to make sure nobody could see her eavesdropping. 2. Jasmine tiptoed across the room. She crept over to the wall and pressed her ear against it, straining to hear Sean and Alicia in the next room. At the sound of laughter, Jasmine squeezed her hands into fists. She glanced at the door to make sure nobody could see her. This is just an example that I whipped up on the spot, and I'm sure I could make it stronger if I tried, but I think it gets the point across. To my ear, #1 has "too many notes;" it's wearing too many bonnets and ribbons. So many of those words are repeating the work of other words ("quick glance," "squeezed ... tightly ... fists," "joyful laughter"), or were inserted to shore up a weak neighbor ("walked quietly," "went sneakily," "tried hard"). Pruning such sentences is like yanking weeds from an overgrown garden: it lets us see the flowers. One tool I like to use during first drafts is what you might call stream-of-consciousness writing, or spontaneous writing (a la Kerouac). Quite simply, it involves channeling a voice and just writing down whatever that voice says--not censoring, editing, or judging it. Just letting it flow. Naturally, this style requires a lot of editing in subsequent drafts, but it can be useful for bursting through doubts or hesitations, or for making the most of a short writing session. This is often the style of my first drafts. Later, I go back and cut up all those long rambling sentences, prune out those endless conjunctions. If you've read any of my published writing, you'll know that I actually favor shorter sentences. But something about writing long sentences helps me get into a rhythm.